I'd not read Reisz before this book but the blurb called to me. Romance, mystery, family secrets, a doctor who took in unwanted children - so much catnip! I requested it and was delighted to be approved. After Allison's parents died she went into foster care until a local surgeon took her home. She was happy there until one night she falls down the stairs and ends up in the hospital. Someone called her elderly aunt, claiming to be Allison, saying that someone was trying to kill her. Her aunt swoops in and takes her away. She's had no contact with the doctor or her foster siblings since then. She's made some choices that are different and her life went in a direction she never expected. The letter from her foster brother Roland about the doctor's poor health comes as her life has come to a crossroads so she drops everything and heads back to her old home. What follows is a story of secrets, family bonds, hidden romances, good intentions gone awry, the nature versus nurture debate, and the ethics of science. The beginning of the story was draggy, with lots of exposition and laying the groundwork. I noted at 34% that the story wasn't working for me yet and I hoped it would pick up soon. Not that nothing had happened, some things moved quickly, but overall the story arc was progressing slowly. It did slowly start to pick up and really gained momentum towards the end. It's a character driven story which I usually like. It took time for me to warm up to Allison and Roland, as well as their siblings Deacon and Thora. I liked Deacon; he was irreverent, snarky, talented, self-aware, and fiercely loyal. But he wasn't a main character, and I liked him better than Roland who was. Roland was complicated.He had a rocky past, had made choices based on fear, as we sometimes do, but was compassionate, kind, and loyal. Still, he never quite clicked with me. Another main character is their foster father, Dr. Capello. He at times seemed to good to be true, almost saintly, but slowly we discover the real man, the less than saintly human being. At the end, I felt sorry for him and I hated him. The story was creepy and atmospheric, definitely evoking classic Gothic romances, complete with secrets hidden in an attic. The pacing was uneven but the last, oh 40%, lured me in and kept me reading. I had to know the secrets, all of them. And wow, did Reisz deliver on those secrets. 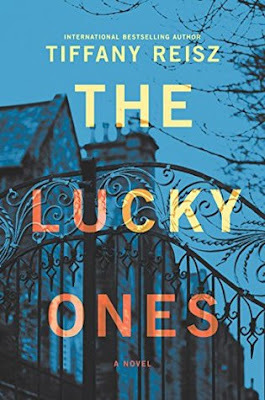 "The Lucky Ones" is a twisty, evocative tale that's a little bit Gothic, a little bit horror, blended with romance, mystery, and a touch of religion. It didn't wow me, but it made me think. "I keep thinking you're going to judge me." "If I wanted to judge people all day I'd either be a priest or get a Facebook account," Roland said. "I didn't do either." Too many secrets in this house. So many they were starting to feel like...Lies. But they were a family, weren't they? And she'd gotten very good at lying. It didn't even feel like lying anymore. It felt like forgiveness, leaving the past in the past. It felt like mercy. It felt like moving on...And what was one m,ore secret in this house packed to the attic with secrets? Roland had secrets. So did she. It gave them something in common. Roland might be onto something. Maybe the secrets didn't have to be a wall between them. Maybe they could be a bridge. The blurb really does sound cool! I think I should look this one up. Most people seem to like it. I'd be interested to see what you think of it.